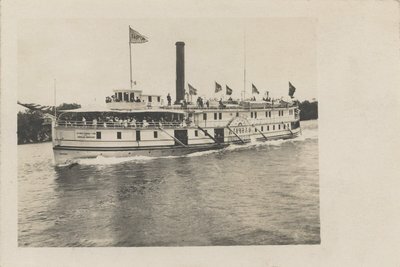 Real photo postcard of the Lake Ontario & Bay of Quinte Steamboat Company steamboat CASPIAN. The print was reversed with the lettering in the correct order on the flag but not on the paddlebox. The canopy has been deployed over the forward promenade deck and is sheltering a crowd of passengers.